Editors' pick: Originally published March 26. Selling $1.50 cans of slime and $5 virtual reality headsets across a growing store base continues to work wonders for discounter Five Below (FIVE - Get Report) . Five Below's stock surged 10.8% to $42.25 on Thursday after being one of the rare retailers to not spout doom and gloom on the current state of its business. The discounter reported fourth quarter earnings of 90 cents a share, beating analyst forecasts for 89 cents a share. Same-store sales rose 1%, narrowly ahead of estimates for an increase of 0.9%. Same-store sales have increased for a remarkable 11 straight years. 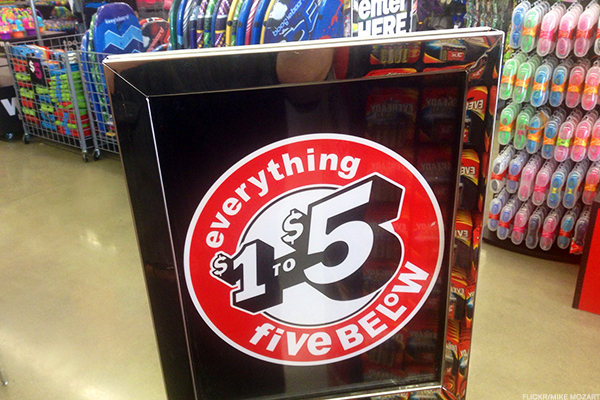 For the first quarter, Five Below sees earnings in a range of 12 cents a share to 14 cents a share. Wall Street anticipated 13 cents a share to 16 cents a share. Full year earnings are seen coming in at $1.55 a share to $1.61 a share, ahead of analyst projections for $1.58 a share. "There are some retailers out there that are winning, and in many cases they have a differentiated concept and they offer value," said Five Below CEO Joel Anderson in an interview with TheStreet when asked how the company has managed to overcome retail's general malaise. "We don't think about it as being Amazon (AMZN - Get Report) proof, you have to deliver an experience and value today so people come to the store, and we do both." To say Five Below, which operates more than 500 stores mostly across Texas, Florida and the Northeast, is the exception in retail right now would be an understatement. Just in the past few weeks, Wall Street has seen bankruptcy filings from sporting goods retailer Gander Mountain, RadioShack successor General Wireless Operations, everyday value price department store operator Gordmans Stores (GMAN and appliances, electronics and furniture retailer HHGregg (HGG . Last Wednesday, children's apparel retailer Gymboree cautioned it was running low on cash and may not survive. Sears Holdings Corp. (SHLD voiced concerns on Tuesday about its ability to stay in business, while women's apparel chain Bebe (BEBE is reportedly on the brink of closing all 170 of its stores. Five Below plans to open 100 stores this year, many in California, a new market for it. Anderson still sees the chain reaching 2,000 stores over time. "We continue to view Five Below as one of the most compelling growth retailers and look for longer-term earnings per share growth of 20% plus," wrote MKM Partners analyst Patrick McKeever. As for what's cool in Five Below's treasure hunt-like stores at the moment, it's not necessarily Disney (DIS - Get Report) Frozen products or adult coloring books as in recent years. Nope, try cans of sparkly slime that could be whipped up to form all sorts of visual creations. "This slime trend is a testament to things just emerging, and when they do we are ready to react quickly," Anderson said. "For a lot of kids they become entrepreneurs, and have been selling the slime to their friends at school." At $1.50 to buy from Five Below and markup probably to $10, the slime business may not be too bad a one for a 10 year old to be in. Editor's Pick: Originally Published March 24.